The client wanted a poster that would quickly catch the eye of visitors and communicate to attendees when and where the main events for their product exposition would be. The event was held in Chicago at a location on the Chicago River, so I incorporated imagery that was identifiable to the region with a subtle nod to the Chicago River and Lake Michigan. The silhouetted skyline graphic was heavily edited to incorporate the client's color palette. Each window, doorway, and shadow had to be separately colored, while the wavy lines in the text below the image acted to both enhance the text and make reference to water. Because the expo was being held in Chicago, I wanted to use imagery that was immediately identifiable with the city. The first iteration of the poster included a background image with overlaid text. 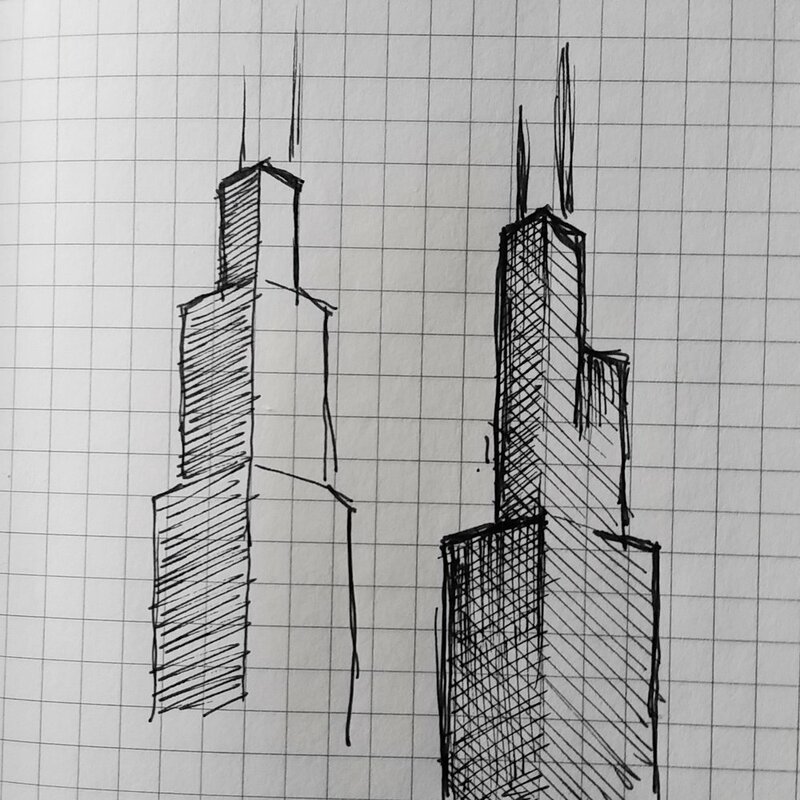 The image was a screen-print of the Hancock Tower, a Chicago Icon. The client felt that this version was too dark and cluttered, so I lightened the image and introduced brighter colors. As is sometimes the case, when a design isn't quite working, a client will ask for something completely different. In this instance, they liked the colors of the second design but thought they might want an image of Wrigley Field in the background. With their input, I created a layout using Wrigley Field imagery to help them see what it might look like. We both agreed that with each design the background imagery was too distracting, so I went back to the basic text layout, which the client liked, and chose to simplify and flatten the overall design to make it cleaner looking and feeling. Brainstorming in the form of sketches.